1. 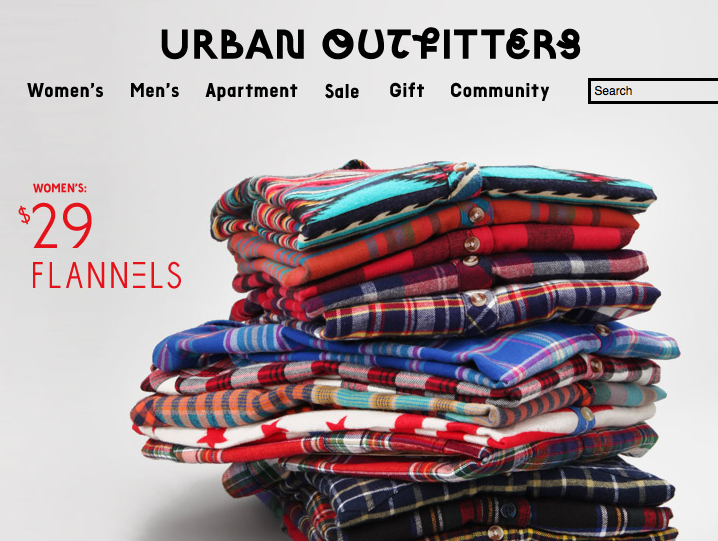 Urban Outfitters – This is a no-brainer for America’s fashion conscious, and some may find it overrated sometimes. But I think Urban always has eccentric items no matter what, so you know what? I don’t care if everyone else shops here. Your style is chiefly based on how you put together your clothes and accessories anyway. I usually don’t buy anything full-price here because it will most likely go on sale at some point and the quality of some brands aren’t always the greatest. They also periodically have sales on already reduced-priced items, from an extra 20-50% off. I prefer the brands Staring at Stars, Silence & Noise, Deena & Ozzy, and Ecote. 2. 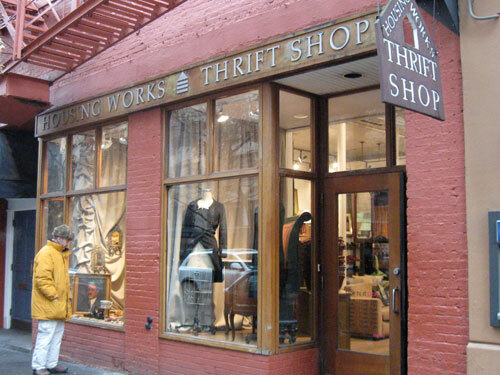 Housing Works – This is one of the best thrift shops you’ll probably ever go to. Housing Works is a non-profit charity whose profits go to New Yorkers living with HIV/AIDS. It also happen to have great deals on everything from apparel to books to home goods. (Someone I know bought a brand new Marc Jacobs bag for just $55 and Prada Shoes for $125.) With student ID, students get 20% off their purchase on Tuesdays! Brand name or no name, its up to you what you choose to buy, but you do not want to not miss out on the great deals this sweet thrift shop has to offer. In addition to purchasing it’s items, you should also think about donating your clothing, shoes, books, artwork, jewelry, or housewares. Sharing is caring! 3. ASOS – ASOS is a British online retailer for men and women. It offers a wide array of hipster-y fashionable brands, but some of it’s prices tend to be a bit higher than what you might be looking to spend, so I suggest checking out it’s sale section: Women, Men. To see trends and outfits exhibited on the site, go to it’s Outfit & Looks page. To buy and sell new, pre-owned, and vintage clothing, go to ASOS’ Marketplace. Dressing like a hipster isn’t just in what you wear; it’s how you wear it, often adding much-needed accessories to create the hipster look. For example, you can wear a white t-shirt with a plaid shirt and skinny jeans and think that’s hipster. Or you can wear that outfit with a fedora, an infinity scarf, a pair of oxfords or Jeffrey Campbell Spike Litas, and a piercing or two or five… and Voila! You’re dressed like a hipster. Who doesn’t like a good breakfast platter? Please, find me one person who doesn’t. Even vegans can enjoy vegan pancakes and fruit. Breakfast is one of my favorite kinds of foods. Eggs, pancakes, waffles, french toast, yum! The exception: I’m not one for the breakfast meats. No sausage or bacon for me. Go ahead, call me weird. I’m used to it. Luckily for me, there is a rather inexpensive cafe right across the street from my school called Brown Cup that serves breakfast food all day long. And it actually serves food that tastes like it would cost more in New York. If I am craving an egg platter or pancakes, I go there. For $4.50 (plus tax), I get two eggs any style, home fries, and toast. For $4.00, you get three plain pancakes, and for just a $1.50 more, you can make them strawberry, blueberry, or chocolate chip. (Banana pancakes are only $1 extra.) This is way less expensive than any diner you’d go to and the taste is nothing less than great. If you’re in the area, I suggest you go to Brown Cup for breakfast food, or for it’s plentiful options of sandwiches and salads. You can make your own sandwich or salad, too! It also serves soups from Hale & Hearty, which are dee-lish! 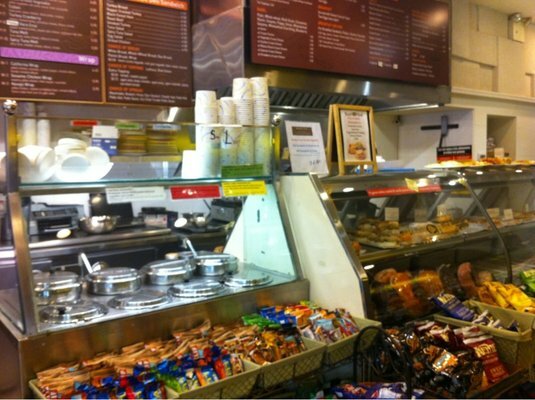 If you’re feeling lazy or don’t have time to pick up food, Brown Cup is also on Seamless.com, a website in which you can order food online for delivery (or take out). 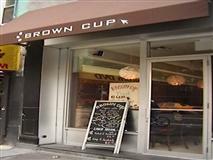 Brown Cup is located at 334 8th Avenue, close to the corner of W. 27th St, in Manhattan.